Do you have sleep apnea, and is it causing you distress? Sufferers of sleep apnea need qualified help! As a result of listening to this audio, you can get a good night's sleep and be energized for the day! Sleep apnea affects the way you breathe when you're sleeping. In untreated sleep apnea breathing is briefly interrupted or becomes very shallow during sleep. These breathing pauses typically last between 10-and 20-seconds and can occur up to hundreds of times a night. Untreated sleep apnea prevents you from getting a good night's sleep. When breathing is paused, you're jolted out of your natural sleep rhythm. As a consequence, you spend more time in light sleep and less time in the deep, restorative sleep you need to be energetic, mentally sharp, and productive the next day. This chronic sleep deprivation results in daytime sleepiness, slow reflexes, poor concentration, and an increased risk of accidents. Sleep apnea can also lead to serious health problems over time, including diabetes, high blood pressure, heart disease, stroke, and weight-gain. Stop Sleep Apnea with the help of Hypnotherapy! 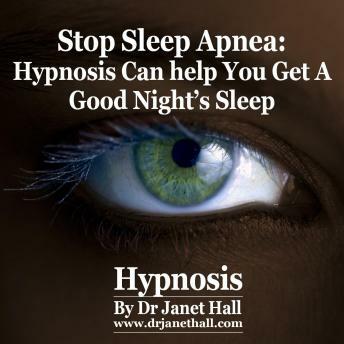 Dr Jan sees people on a one-to-one basis and has had success in dealing with those suffering from Sleep Apnea. This recording comes from Dr Jan's clinical success with helping clients get a good night's sleep and be energized for the day. The goal is that you will begin to overcome anxiety about Sleep Apnea and begin to look forward to having a good night's sleep. The recording works in a gently relaxing way to establish better and healthier patterns of breathing and sleeping. Allow your mind to communicate with the cells of your body and heal the Sleep Apnea on a very deep level, on a cellular level to make deep and profound changes so that as you go through the day, you remain alert and energized. You can focus on tasks requiring full mental concentration, retaining alertness from the start to the end of the activity. Any physical and mental feelings of extreme tiredness are simply on the very edge, on the periphery, allowing you to focus on the alertness in the center. Feeling positive, feeling good that you can trust your body and your body knows how to allow your spirit to lift you up, to create good feelings of positive expectancy. Safe, comfortable and feeling good and healthy. You are sleeping well in every way, and surprised and amazing and overjoyed at the confidence and great success that you have in yourself, breathing free. Imagine how you will feel when your Sleep Apnea is a thing of the past! The sooner you begin regular listening to Dr Jan's hypnotherapy recording, the sooner that will be reality for you. Listen to this recording over and over again. Listen every day, if you can, and certainly every night as you go to sleep and be patient. If you were unfit and just started going to the gym you wouldn't expect to be fit after one visit.